Greenbriar Picture Shows: They Wouldn't Let 007 Indoors! They Wouldn't Let 007 Indoors! Here's fertile ground for deeper research. 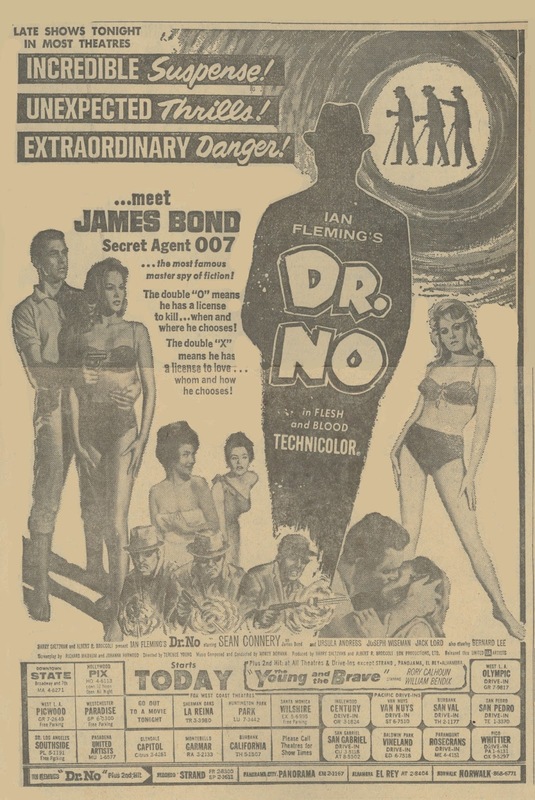 How many markets saw Dr. No first (and only) at drive-ins as opposed to hard-tops? The L.A. opening at left was typical for that territory. Big pictures would go to in and outdoor venues so as to give access to everyone in a sprawling region. 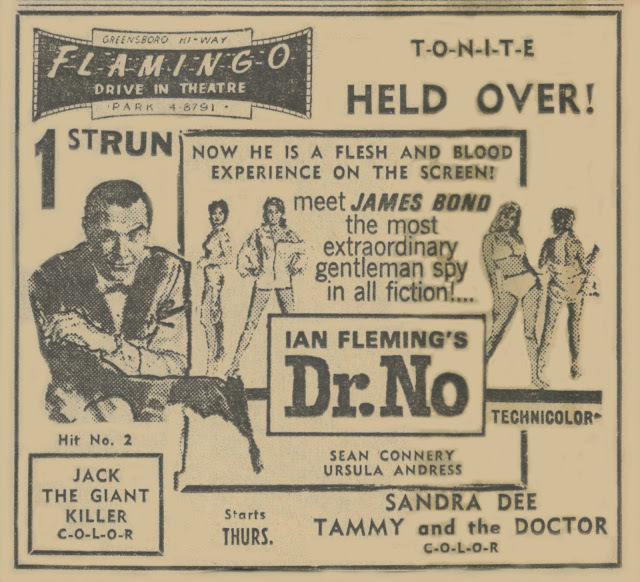 But what of Winston-Salem, NC, where Dr. No had its first-run at the Flamingo Drive-In (above) and no place else? Hard to imagine the first James Bond thriller confined to a dirt field with car speakers after downtown venues ... turned it down? I used to follow Winston ads with a fine comb; they had two "A" houses in the early-to-mid 60's, the Winston and the Carolina. These two could handle only so much product. Lots of good stuff wound up playing under a roof of stars, like Sons Of Katie Elder, the second James Bond, From Russia With Love, and virtually all the Hammer horrors, many tossed to low placement among all-nighters where a brand new Curse Of The Mummy's Tomb might unspool once, and at 2 AM. Is it a wonder so many fans saw these pics for first times on TV? In many towns, they just weren't accessible. I see here that Jack The Giant Killer was Dr. No's bunkmate at the Flamingo. Did Winston-Salem ever play Jack under roof? I don't know about anyone else, but getting to a drive-in at age ten or eleven was, for me, a climb up the Matterhorn. With no driver license and parents disinclined to go, it just couldn't be done. How many of us drooled over ads for the unattainable? I sure did, and often. United Artists would eventually use 007 as backup for newer stuff they booked to drive-ins. That's how I was able to catch Goldfinger and Thunderball as late as 1981 on large screens. They were by then support for outdoor programming after years on television, the 35mm prints banged to near a point of uselessness (but all were IB Tech, and still lovely to behold). 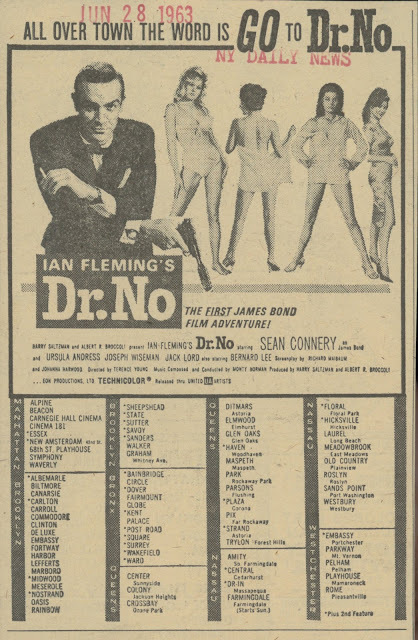 More Dr. No here and here.